Investigating What Is The Best 308 Muzzle Brake - And Is It Worth It? →Investigating What Is The Best 308 Muzzle Brake – And Is It Worth It? What is the best 308 muzzle brake? Before we get to that, let us first make sure what exactly is a muzzle brake and why would you want one. 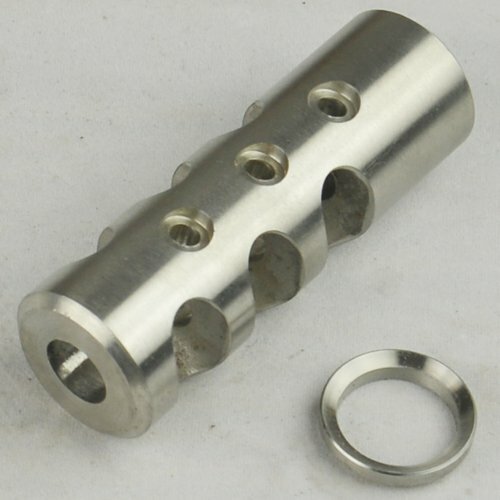 A muzzle brake or recoil compensator is a device connected to the muzzle of a firearm that redirects propellant gases to counter recoil and unwanted rising of the barrel during rapid fire. Muzzle brakes are often used on pistols for practical pistol competitions, and are usually called compensators in this context. All muzzle brake designs share a basic principle: they partially divert combustion gases at a generally sideways angle, away from the muzzle end of the bore. The momentum of the diverted gases thus doesn't add to the recoil. The angle toward which the gases are directed will fundamentally affect how the brake behaves. If gases are directed upwards, they will exert a downward force and counteract muzzle rise. Any device that is attached to the end of the muzzle will also add mass, increasing its inertia and moving its center of mass forward; the former will reduce recoil and the latter will reduce muzzle rise. If you want to learn more about the difference between muzzle brakes, compensators and flash hiders, check out this great article from Josh over at downrangedaily.com. The main advantage of using a muzzle brake is the reduced recoil. The reduction in recoil can make rifles that would be unshootable more manageable to shoot. It also helps to increase accuracy, which is something most shooters would want! Cost - A good muzzle brake can be expensive. Not to mention the cost of having a good gunsmith install it for you! Noise - Due to the fact that the muzzle blast is no longer being diverted away from you, but rather back at you, the noise you are exposed to increase. If you want to know how badly noise can affect your hearing, please do yourself a huge favor and check out our in depth article on How Shooting Can Affect Your Hearing. Additional length and Weight - Adding a muzzle brake to your rifle makes the barrel longer and adds weight to it. It might not be a deal breaker for a lot of people, but can be bothersome to others as it can influence handling of the weapon. A weapon also generally fires differently with the muzzle brake on vs without the muzzle brake, which can affect your consistency in shooting at target. Below we will look at 4 muzzle brakes to fit on your 308. These are our 5 picks that we think could be the best 308 muzzle brake options out there, but we realize that there are other great options out there that other folks could argue are even better. So if you do have some thoughts, please feel free to share them with us in the comments section and tell us what you think the top 308 muzzle brake is and why. This item has been designed to remain strong during long shooting sessions, and it has been designed to be as functional as possible for you. You need to make sure that you have something that is so simple to use anyone could learn how to use it. This is a great device when you want something that is very small and simple. You can slip the unit into your pocket when you are not using it, and it takes up no room when you are managing it. There are some muzzle brakes out there that are really hard to handle because they are so big, and you will have a really hard time handling them because they are not as small as the TANKER MUZZLE. You can cut down on the sheer size and weight of all the things that you use for shooting when you get a small muzzle brake like this. It comes with a special clip that locks on to make it safer, and it has been coated in a special polymer that protects the unit from heat. The GRG is made from stainless steel, and it has been created to make it easier for you to install it, and it is so strong that nothing could ever break it down. You need to make sure that you have invested your time and money in a really nice muzzle brake that is going to help you get more shooting done, and this is one of the best 308 muzzle brake products because it vents itself. The circular vents on the sides of the device make it ideal for someone who does a lot of shooting, and it has a locking collar on it that will help keep it in place. You do not want anything flying off your weapon, and you can avoid that problem by making sure that you have this brake installed. It is really easy to use, and it gives you a chance to have security once you install it. You should choose this one for its pitch, its size and its simplicity. You will have all that you need without getting into something too complex. 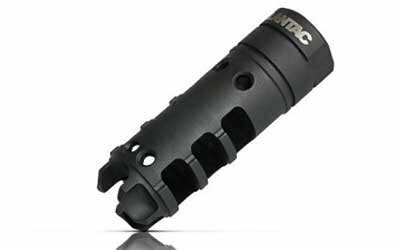 The LanTac is a great muzzle brake that is very small and made from a nitride coating. The small size of this brake is a really good thing for someone who likes to carry a lot of gear, and you can clip it on without any problem. 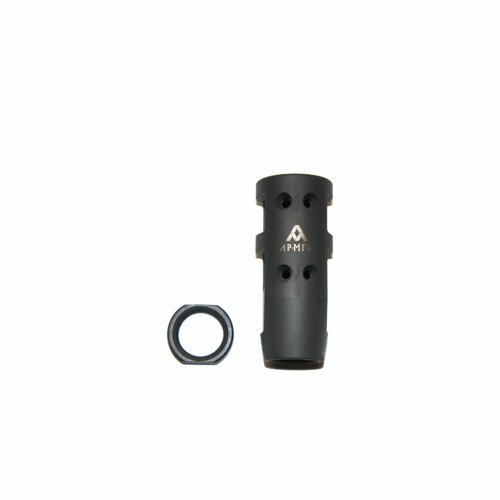 This muzzle brake is among the best 308 muzzle brake because it is made to make your life easier. It is easy to clip on, and it is even easier to remove when you are ready. The item is the best 308 muzzle brake because of its small design and easy use with .308 cal ammunition. You can pack it any time you want for easy use, and you can pull it out whenever you need it. There are a lot of people who do not have functional or useful muzzle brakes, and it ruins their shooting. You can even pull this one out at the range if you are planning on practicing before you go into the field. You can set yourself up with this muzzle brake when you are looking for help with your next shooting assignment. There is a small jam nut on the brake that will help you hold it in place, and you will be able to pull it on and off pretty easily when you are on the hunt or at the range. There are a lot of people who are trying to get better results from their weapons, and you will have almost no extra weight on the end of your gun. You are signing up for some weight when you attach it, but you are not signing up for so much that you cannot function. This is a great device when you want to use something simple, and it actually goes together a lot like the nut on your drill. You can use it to get better results from your weapon, and you can carry it with you without any trouble. The vents prevent gas buildup in the muzzle, and you will be able to fire many times over without any worry about the gun getting too hot or malfunctioning because of the brake. This is one of the better 308 muzzle brake products for any hunter. These are the top 308 muzzle brake products on the market today, and every one of them has their advantages. You can get one of the best 308 muzzle brakes that will be bulky and give you some extra weight, and there are others that are going to be so small they require almost no work at all to use. You are trying to make shooting safer and more fun, and you need to make sure that you have picked out the muzzle brake that you think you will actually use. Consider the environment that you are shooting in when you are picking out the muzzle brake, and you will find the right 308 muzzle brake when you have taken everything into consideration. You are trying to build up the amount of gear that you have to use when you are hunting or shooting, and you might even try to purchase more than one of these so that you have a light and a heavy version. People who are very picky about the guns could use any of these items, but you should be able to narrow it down to just one of the ideal 308 muzzle brake products when you are ready to go. Which Muzzle Brake Do We Think Is The Best 308 Muzzle Brake? The SuperComp® XL Muzzle Brake is the largest and most reliable one on the list. You could go for a smaller device, but this one is sure to work no matter where you are. It is very easy to install, and it makes sense to use when you are trying to get better performance out of your weapon. 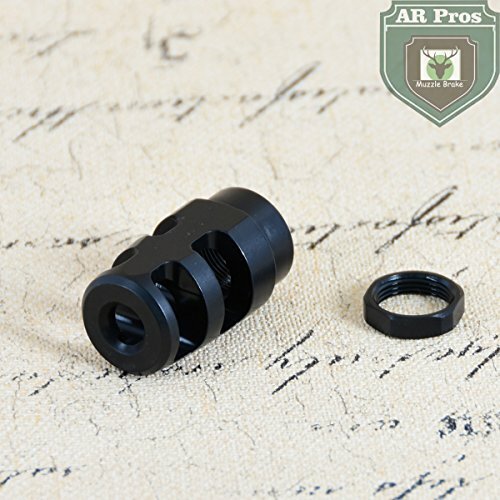 You will have every opportunity to make your shooting more accurate, and you will avoid problems with your gun that are caused when you are not using the right muzzle brakes. Get something like the SuperComp® XL Muzzle Brake because it makes the most sense for all hunters, and it is clearly the ultimate 308 muzzle brake product you can get. What Do You Think - What Is The Best 308 Muzzle Brake? Are there muzzle brakes for the 308 out there that are great, which are not on our list? Of course! So if you have a muzzle brake in mind that you think is indeed the best 308 muzzle brake, please share your thought with us in the comments section below.